Ahh yes, the swords under the palm tree. Reminiscent of the big X (instead of W) in "It's a Mad, Mad, Mad, Mad World"
A Darwinian missing link between the 2000 bag and the 2005 bag that shown an intermediate evolutionary state. Much like the previous version, but added non-sensical green lines and extra obfuscation. 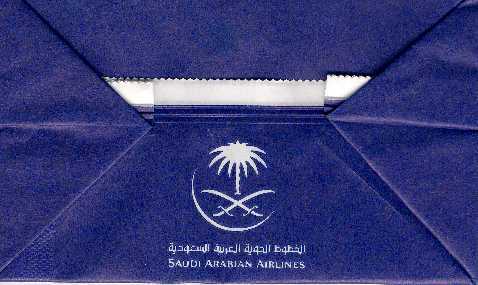 Saudi Arabian goes subtle with understated light colors and swishes. 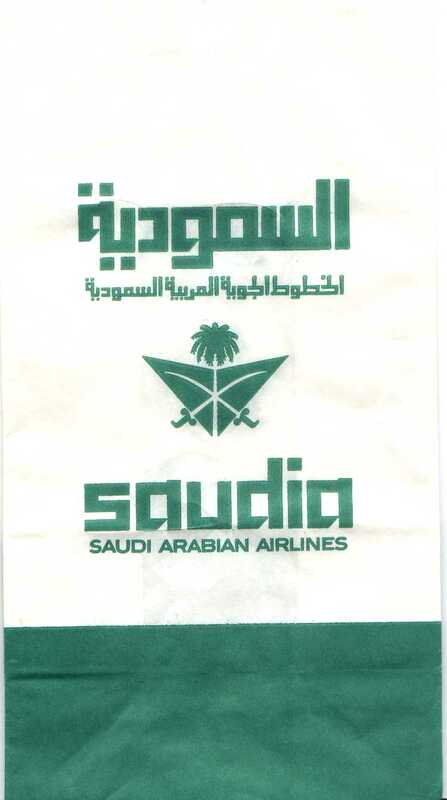 They've gone to logo only, supplanting their airline name from the bag. 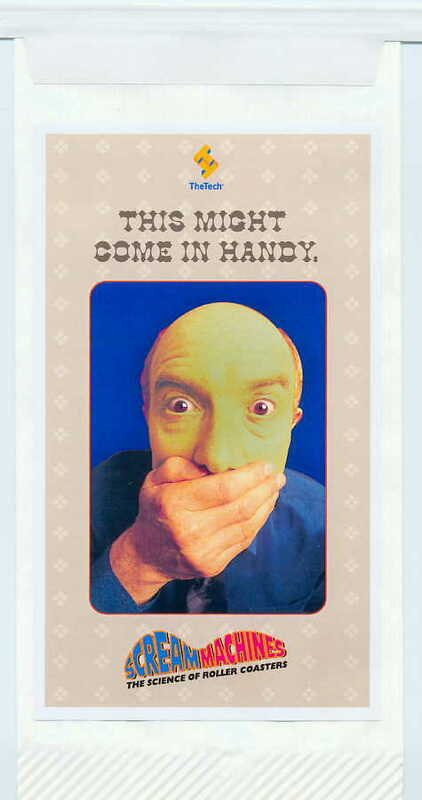 Says "SDS Germany" inside side fold. Fold NOT scanned in, sorry. 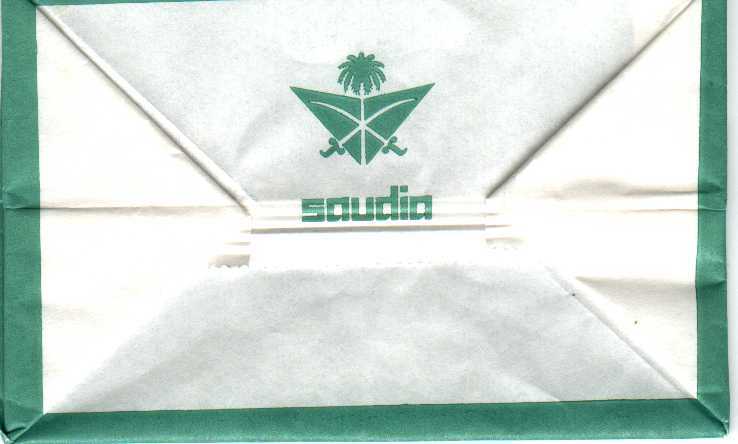 Says "Saoudi Blantex" inside side fold. Fold NOT scanned in, sorry. 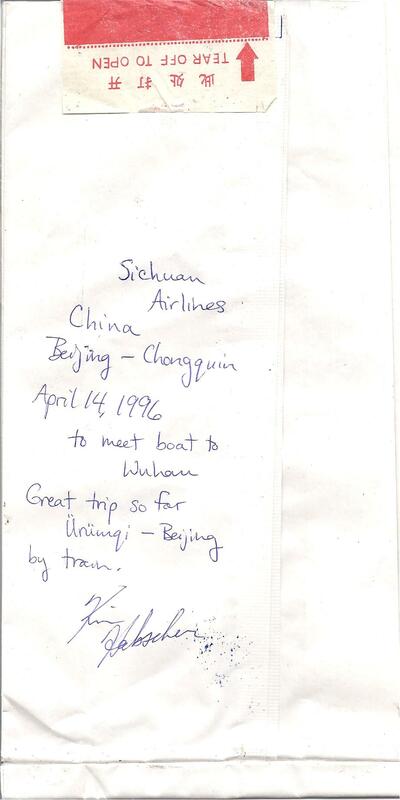 Says "Update Hong Kong" inside side fold. Fold NOT scanned in, sorry. 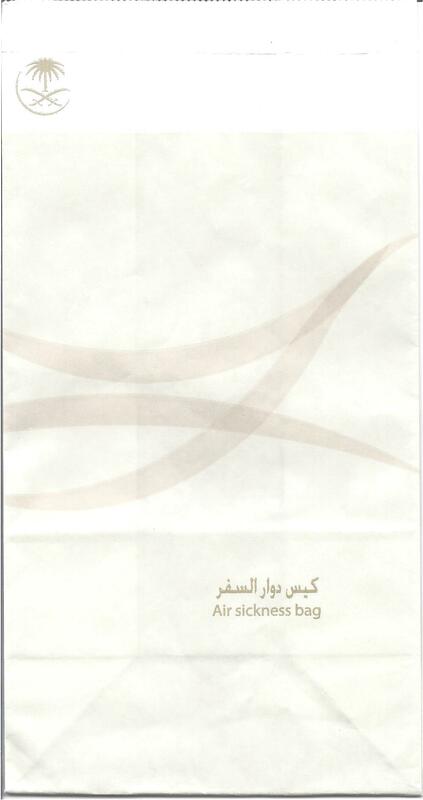 Weird time-warp logo that seems to indicate you should expect turbulent flow of the air stream when you fly. 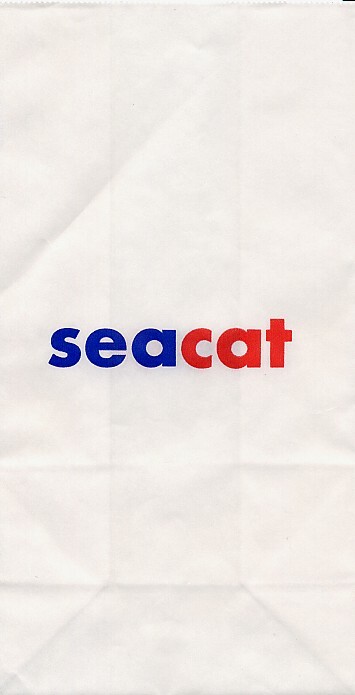 Adding letters strategically to the bag would render the airline's name as SCALE, SCALD, SCALY, or MESCALINE. A bag Brian Scalabrine would love. 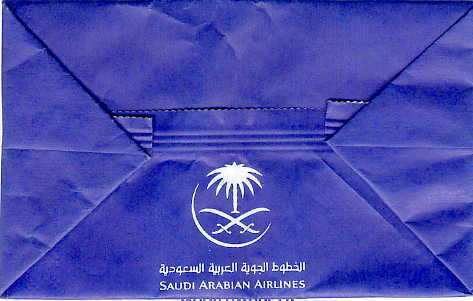 While the printing is identical to the other SCAL bag, it's printed much darker in Navy, not just blue. 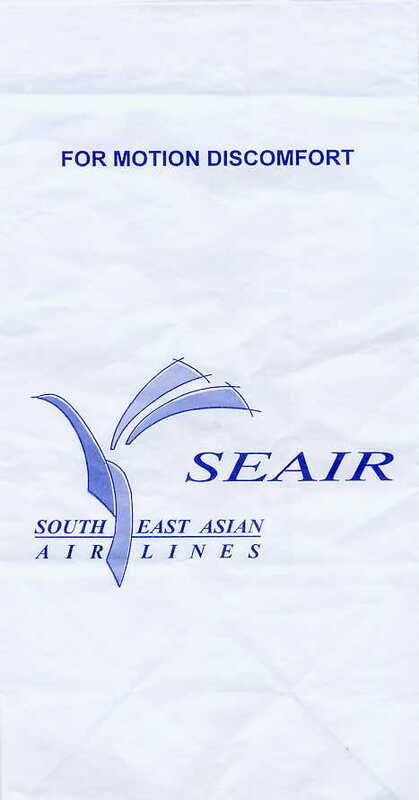 Scanair -- the airline for teetotalers. 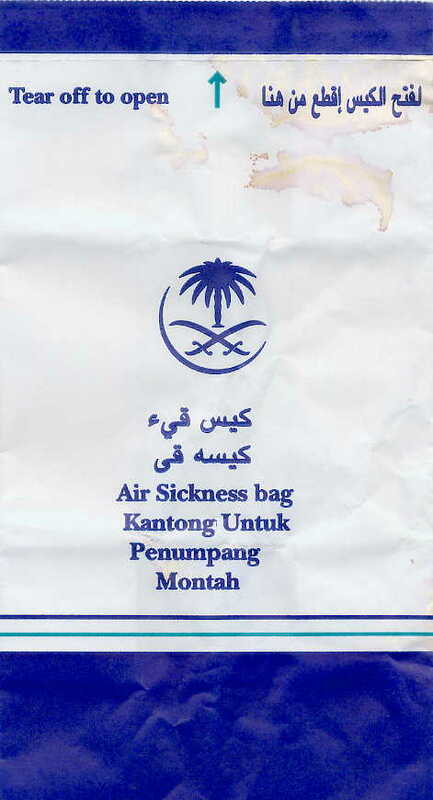 Whatever you do, don't drink on this flight! 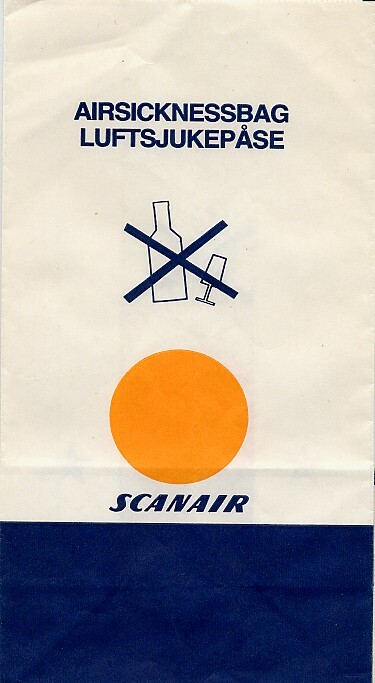 This long defunct Swedish carrier became Premiair, as you can verify by the ubiquitous big orange dot that got carried over to the new airline's bag. As an aside, you have to love Swedish, a language where a word can have the letters FTSJ appear sequentially. An unbelievably beautiful and detailed bag. 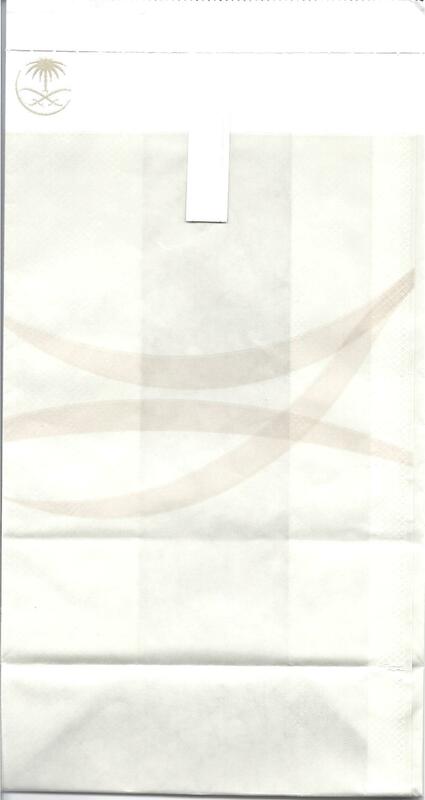 You actually get the feeling you're on a cruise by looking at the bag. 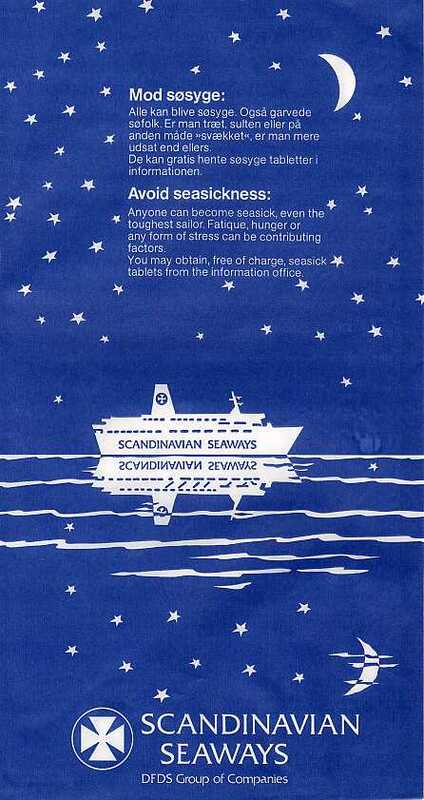 Scandinavians have cornered the market on beautiful design. The attention to detail in the ship's reflection shows how much loving care went into the bag, not to mention how they coddle the passenger by telling them that even the toughest sailors get sick. 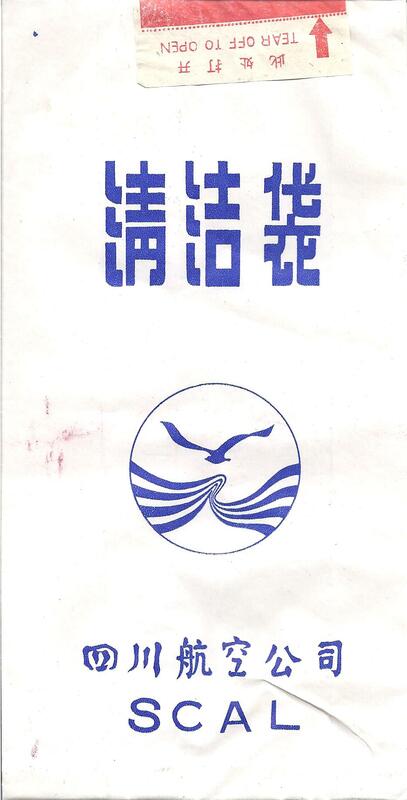 Identical to the other Scandinavian Seaways bag except they farmed this one out to some company other than Duni, since the Duni quality symbol is missing. According to Kathleen, this bag is "...from the hit comedy, SCARY MOVIE 2, starring Shawn Waynas, Marlon Wayans, Anna Faris, Chris Elliot, Tim Curry, Tori Spelling and directed by Keenan Ivory Wayans. 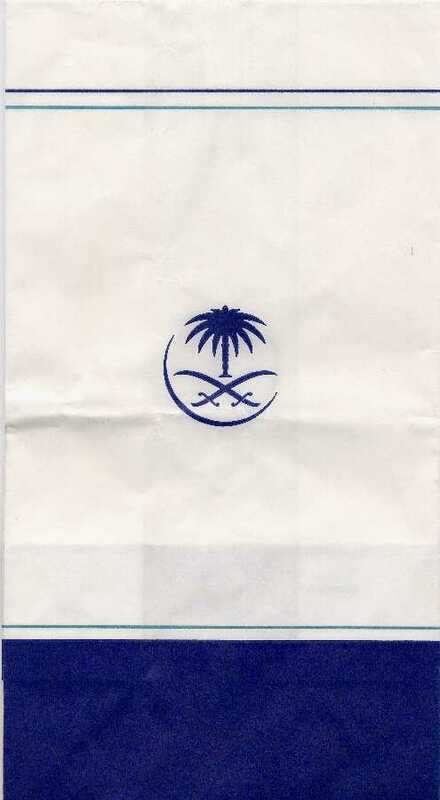 This official promo bag was available only in the UK." I'm not quite sure terms and conditions are on site, but it's kind of cool to tout an on-line tabloid right on the bag. An unbelievably beautiful simple design of a scorpion on a golden circular background. The way the scorpion is drawn makes it look like one that walks upright. This specimen hails from a Roller Coaster exhibit at The Tech Museum of Innovation in San Jose, CA. 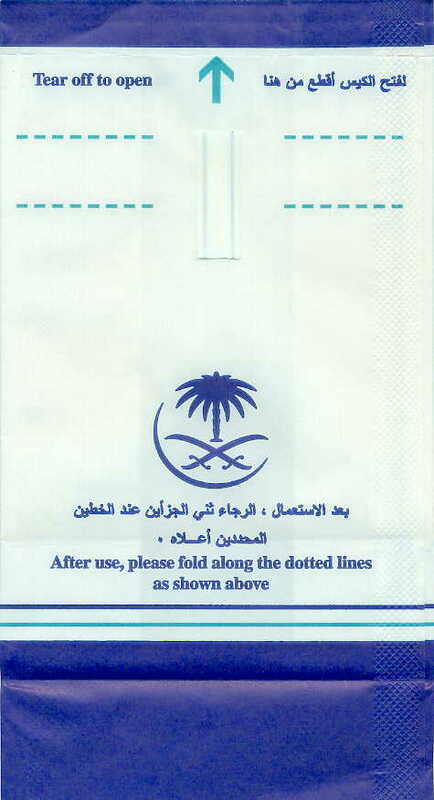 While it's just a sticker on a bag, the sticker says, "This Might Come in Handy." with a picture of a guy with a green face ready to toss his cookies. It also says, "Scream Machines, The Science Of Roller Coasters". Just what you'd expect from the French, and less! 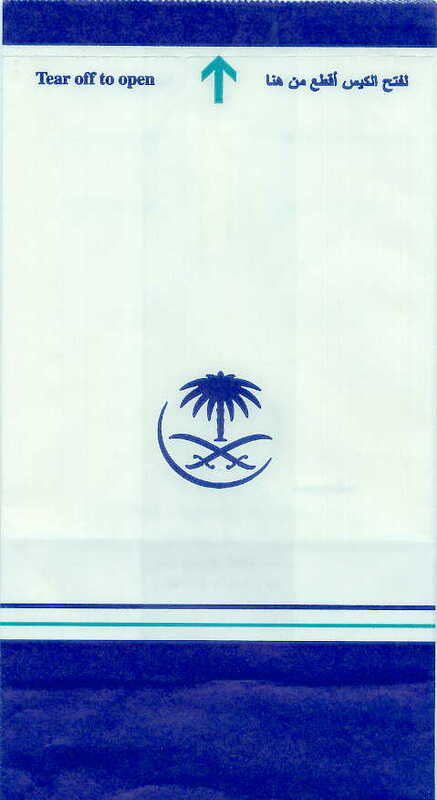 The logo reminds me that somewhere in this world, someone has a job that is far less challenging than mine. A beautiful, sultry mermaid with a well endowed figure and sweaty tail graces this bag. 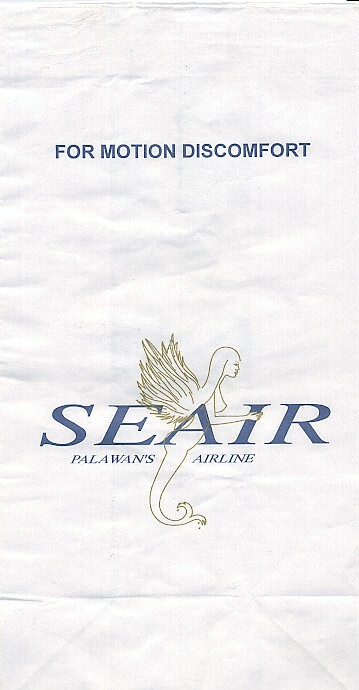 And this mermaid is why every time I go to Palawan, I fly Seair. The abstract logo is vaguely reminiscent of the Kellogg's Corn Flakes rooster, but that's a stretch. Bring back the mermaid! 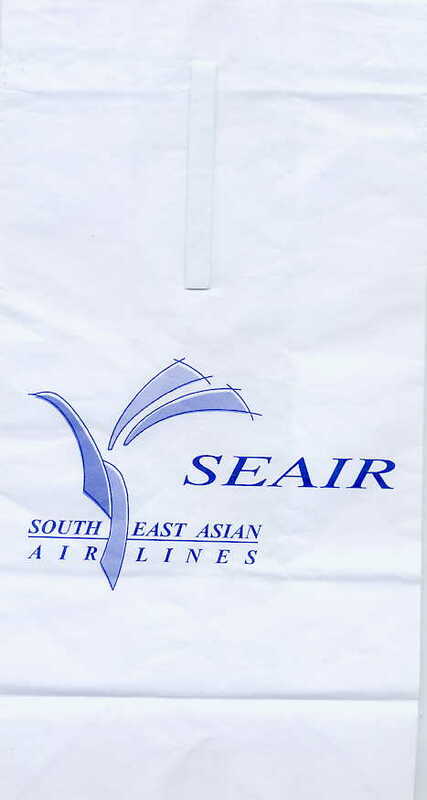 Sealink drops the 'Ferries' in favor of an extraordinarily plain bag, with just an Arial rendering of their name.